PORTLAND, MAINE (June 11, 2016) – Spanish team #123 Tales II, skippered by Gonzalo Botín and Pablo Santurde, captured the 2016 Atlantic Cup presented by 11th Hour Racing as they dominated the offshore legs and fared well in the inshore series. #145 Eärendil, skippered by French duo Catherine Pourre and Antoine Carpentier, finished in second place and #118 Oakcliff, skippered by USA’s Liz Shaw and Libby Greenhalgh (leg one) and Hobie Ponting and Andrew O’Donnell (leg two) placed third. The pair from Santander, Spain was impressive in both offshore and inshore competitions, besting the field during the first offshore leg (Charleston, S.C. to Brooklyn, N.Y.) and second leg (Brooklyn, N.Y. to Portland, Maine). During the inshore series, they won two out of five races, winning the Atlantic Cup with a total of 69 points. “We are really thrilled about winning the Atlantic Cup,” said Botín. “The combination of offshore and inshore racing made it exciting and challenging, but we are really happy with the end result. The Cup is a great event and it is very important for the Class 40 to be successful all over the world, especially in America.”For the first time in its five year history, the race finished in Portland, Maine. Spectators from near and far watched the inshore races at the Eastern Promenade and enjoyed the Atlantic Cup Race Village, which featured a Pabst Blue Ribbon beer garden, kid’s activity zone, food trucks, local merchants and live music. The Atlantic Cup, the longest offshore sailing race in the Western Atlantic and the most environmentally sustainable sailing race in the U.S., featured an international field of nine teams from the USA, Spain, France, U.K., Sweden and Canada. Nine teams started the race and seven finished; two boats dropped out due to personal reasons. The first all-female team in Atlantic Cup history competed in leg one of this year’s competition. 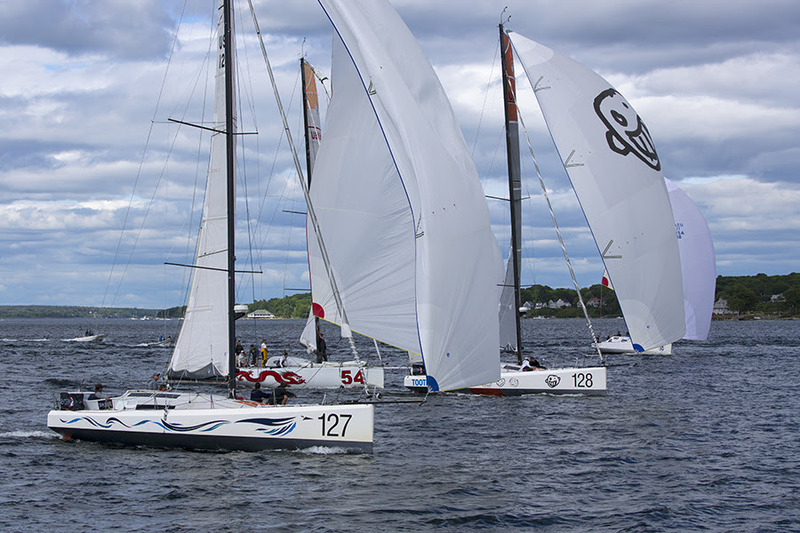 The teams set sail from Charleston, S.C. on Saturday, May 28, stopped in Brooklyn, N.Y. for the second leg of the competition and a Pro-Am event (May 31-June 3), before departing on June 4 for the final leg of competition held in Portland, Maine, June 6-11.